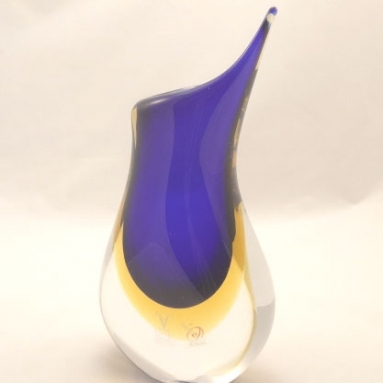 Magnificent Murano Glass Vase Blue - Murano Glass - Murano Glass Gifts Co.
Murano Island, Venice is the place where the world famous Murano glass articles are produced. The glass blowing industry flourished in Venice from the 10th century. But soon it posed a threat to the ancient timber buildings of old Venice and the industry was shifted to the Island of Murano. The Murano artisans were isolated from the world in order to preserve the secret of the glass blowing techniques, so as to retain the monopoly of the Venetian glass industry. Every one of the Venetian glass vases is hand blown individually. This makes each one of these vases unique. 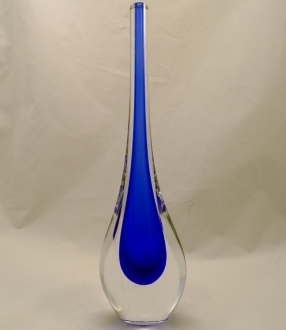 This cobalt blue clear glass vase is a visual treat in itself. On either side of the bright blue cylindrical vase there are two undulating glass ribbons running from top to bottom. 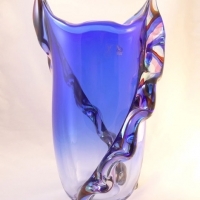 This Murano glass vase can be used as a center piece even without flowers. This Venetian glass vase brightens up any dull corner of your room. 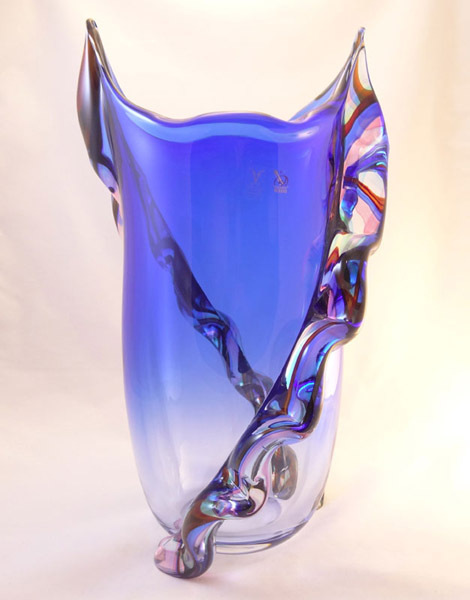 This cylindrical transparent glass vase is 16” tall and the size matters. It makes the vase very conspicuous and attractive. This excellent décor object can serve as a beautiful gift object. It can also be added to your collection of curios. The packing and shipping of the glass vase is done with utmost care by our packing department. Damage-free shipping is guaranteed. The Murano glass vases in our collection are absolutely genuine. 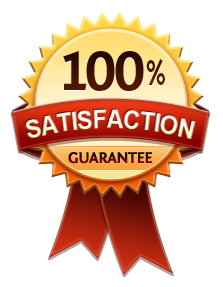 The authenticity of the same is established by the Certificate of authenticity that comes with it. The official sticker of the Consortium also bears out its authenticity. Made in Murano Island. Thanks much -- Really love it!